You've seen me write about the New York Public Library and the Boston Public Library on this blog before, but the most beautiful public library that I've ever been in, and possibly the most ornate building I've ever been in, the Jefferson Building of the Library of Congress, is currently hosting the Books That Shaped America exhibit. The exhibit, which runs through September 29, 2012, is amazing. I was moved to see so many rare editions, some inscribed by the author. 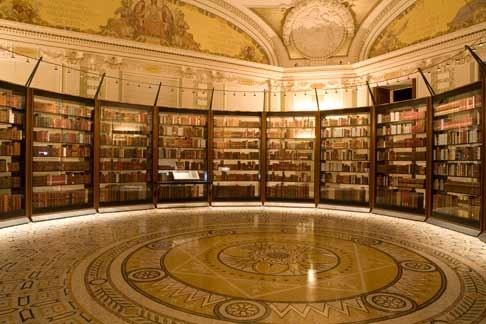 It is also housed in the room next to Thomas Jefferson's own personal library of six thousand books. I urge everyone to go see both of these great collections, but if you can't get to Washington D.C. this summer, at least check out the list of Books That Shaped America. Do you agree with the list? Do you think other titles should be added? Why? Hopefully this will spark not only book discussions but a debate on social issues in our country's history.